Shades of Lehane and McCarthy, and as with some of McCarthy's work, GALVESTON, at times, requires a modicum of patience from the reader. Still, this is an impeccably written, almost poetic tale about the destruction of self, and how an inherently corrupt nature can be a black hole for those you wish to protect. It's a smart mediation on the inescapability of human frailty, and the consequences of our actions, however small, on our lives and the lives of those we love. I applaud Pizzolato's decision to circumvent noir convention and reader expectation, even while playing by its rules, something also in evidence on the superb (and equally grim) HBO series, TRUE DETECTIVE, which he created. 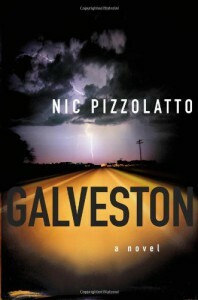 And like that show, GALVESTON will hold greater appeal for those who like their noir to live up to its name.